One of the advantages of our cloud computing platform is the ability to freely change your server configuration, add or remove CPU cores, RAM, and storage to best suit your needs. 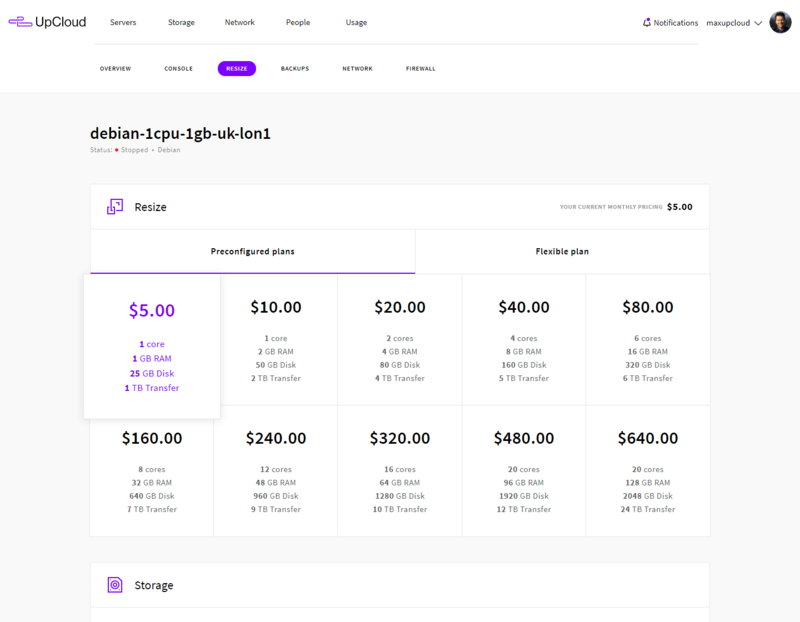 UpCloud offers Flexible server configurations alongside the Simple monthly plans for you to pick from at server deployment, but selecting one does not exclude you from the other. This article explains the differences between these configuration options and how to easily move between them at will. Simple plans offer balanced resource configurations that allow predictability in usage and costs throughout the server’s lifetime. These plans comprise of a public network IPv4 address, an optional IPv6 address, and a monthly public network transfer quota, as well as the CPU, RAM, and storage – all included for a cost-effective monthly price. Flexible plan gives you the ability to freely configure all the resources: CPU, RAM, and storage. Optimise the resource usage and billing for the specific needs of your setup. Network addresses and traffic are priced as per usage so you will never pay extra for unused quotas. Freely scalable servers are great for varying workloads or when you require a server to only run periodically as resources such as CPU and RAM are only billed when in use. To adjust your server configuration, first, log into your UpCloud control panel and open your server details. Making changes to your system settings will require you to shut down the server before the options for configuration and disk management become available. With Windows servers, make sure to give the shutdown command from the operating system to safely power off your server. We highly recommend taking a backup of your server before resizing storage devices. You can continue once your server has been powered down. The option to change the configuration can be found in your server settings under Resize. The resize options allow you to choose between one of the simple and the flexible plans. With the flexible configuration selected, you can set the CPU core count and RAM amount using the sliders up to 20 cores and 128GB of RAM. After you have made the desired changes, save the new configuration by pressing the Save changes button at the bottom of the page. If you require more storage space, you can also scale up the current storage or attach up to a total of 8 storage devices in the Storage section under Resizing at your server details. You can find more information about this in our guide for managing storage devices. When you have finished making adjustments to your configuration, start the server again to take advantage of your newly added system resources. If you change the size of a previously used storage, take a look at the instructions for resizing storage to also update it in the OS. Most of the time, using Simple plans is the most cost-efficient option while Flexible plans give greater freedom. If you require additional memory or CPU temporarily, you can always upgrade to a higher Simple plan and downgrade later. However, note that the storage devices are not automatically resized to allow you to easily return to the original configuration plan. This is due to the process of decreasing storage size is a more complex task than increasing storage. 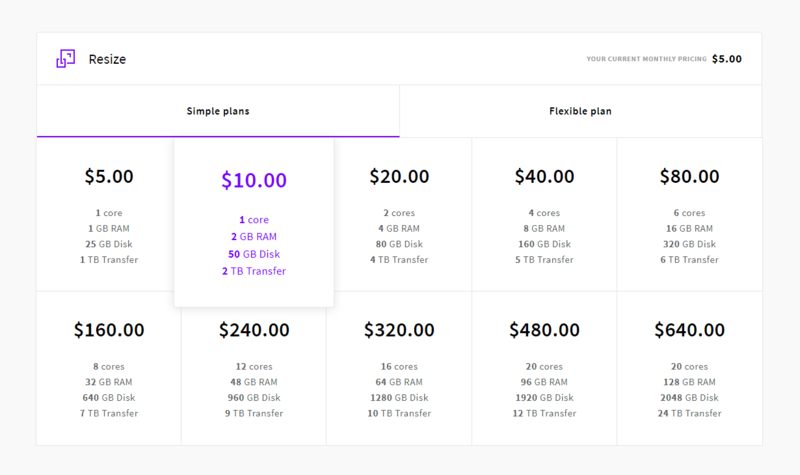 Just as easily as you can jump between the fixed monthly prices, you can switch between the Flexible and Simple plans by simply resizing your server. Switching to Flexible plan from any of the simpler options is as easy as clicking on the Flexible plans tab while the server is powered down. The sliders on the resizing page will indicate your current system resources, simply adjust the sliders to increase or decrease CPU cores and RAM, then press the Save changes button to confirm. Switching to Simple plans is just as easy. Again, make sure your server is powered down and open your server settings, select one of the plans with the same or more storage capacity as your server currently has and click the Save changes button. If you need more server resources, you can always select a larger plan and then scale up your storage device to take advantage of the allocated capacity. Remember to configure the additional storage space also on the OS level by following our resizing storage guide. The Simple plans include much of normal usage for a conveniently combined price while the Flexible configurations calculate hourly pricing purely by usage. Selecting a Simple plan is a cost-effective way to get started, but advanced users might wish to make use of the freedom of the Flexible plan. In case you need to add storage, more than is bundled in the Simple plan of your choice, you can always attach additional storage devices. This way your server retains the Simple plan pricing while any extra storage is billed per GB. If you need to increase the size of the first storage device, go to the Resize section at your server settings and adjust the storage size to your requirements. Note that you can only increase the storage size this way, to safely decrease the storage size follow our guide for resizing storage. When making changes to your server plans, you can see the effect it has on the pricing at the bottom of the Resize view. Feel free to try different configurations, new billing takes an effect only after Saving the changes. To find out more about the Simple and Flexible plan options, see our pricing page for the in-detail list of hourly costs.